Save up to $85.46 when you buy our Kensington Draft Horse Fly Protection Package. Package also includes the 2 items shown to the right. My Clyde/Trakk gets some bad reactions to bites on her legs which leads to months of trying to heal (open wounds etc). If it weren't for these boots she'd miss the summer months. The boots a durable (she is rough on them, wearing them daily for 2-3 months) but I do find two seasons is all I get (maybe less depending). They wash up easily with a bucket of mild soap and rinse with a hose. I keep two pair on the go - one on her and the other ready because the furry piping takes a while to air dry. Great boots for draft cross! 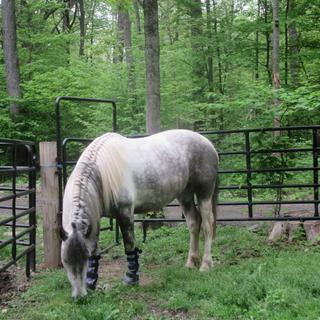 These boots work well on my draft cross mare. She can stomp the hinds down occasionally (probably more of a her problem than a boot problem!) but the fronts stay up very well. Will plan on purchasing again when these wear out! This is our second purchase of Kensington fly boots (4th pair) and they are well worth the additional cost. We tried another "more cost effective" brand before our second purchase and they did not have the durability or the comfort for our horse. He is a large warmblood and finding a good fit is sometimes a problem, but the draft size fits perfect and they really help keep South Florida flies at bay - even in the hottest summer months. These fly boots seem well made and look nice. They also fit my Percheron gelding nicely. However, even with the stiff stay inside to help keep the boots from wrinkling and slouching down, these boots still do. These fly boots are everything that I expected from the ad. They are easy to put on, stay put on the horse and have solved some major problems with biting flies. They look GREAT! They work and they fit, what more can you ask for. They look nice and the fleece lining is nice and soft. We love these fly boots and they save us lots of money when our horses are wearing them, that we would have otherwise spent on sprays. The horses don't mind them at all and they wash and dry easily as well! I have an 18.3 gigantic Percheron gelding. His flytraps have lasted him 2 years and are just starting to show some wear, so time sir new ones. He's pretty tough on his things. are these a set of 2 or 4 ? BEST ANSWER: Set of 2. I was really pleased with them, they are a little softer than some and fit my boy great. These fly boots are a set of two. I have a draft cross. He's only 15.1, but he has thicker legs than a QH. How do I know whether he needs draft or horse size? BEST ANSWER: I have a mammoth donkey. I ordered the draft fly boots in error and didn't realize it until I received this e-mail. The velco that goes around the boot is the issue.The top and bottom straps don't go around as far as the middle strap which causes it to slip down on his hoof. Look at a mammoth donkey online and compare. If your animal has thicker legs then mammoth - I would suggust the draft boot. I have a Shire draft 18.2 hands that I bought the draft fly boots. The skinniest part of his front leg measures 11 inches around.. The skinniest part of his back leg measures 14 inches. His feet are about 8" across. Perhaps that will give you an idea of how big you need to go - compare your horse's measurements to these. I suspect the regular size will work well for you. The draft size is pretty big even on my 17 hand Friesian/Belgian/Thoroughbred cross who is VERY big boned. I fear the draft size would be too big for your horse. The fly boots are very roomy. I would think that unless you have a true Draft horse size will fit. The 'horse' size will most likely fit him. The 'draft' size are really big for large horses. How many wraps per set? BEST ANSWER: One wrap for each front foot. Item is sold in pairs.